If you’d asked me, prior to the announcement last year of the RM-07, if I was ever likely to express anticipation about a Pioneer active monitor, the answer I think would have involved a raising of the eyebrows. However, since the launch of the RM-07 (and the smaller RM-05), I’ve been genuinely looking forward to getting my hands on a pair. So, what’s going on? Well, first, what do we generally know about Pioneer? If, like me, you grew up a spotty hi-fi geek in the ’70s, you’ll certainly remember the PL12D turntable — almost invariably partnered with a Shure M75 cartridge, and the almost obligatory upgrade from the beginners’ Garrard SP25 MkIV. And then, in the early ’90s, among Pioneer’s huge range of hi-fi separates, the A400 was for a while widely considered the best-sounding mid-level integrated hi-fi amplifier. Moving up to date, Pioneer of course have a profile in the DJ sector, with their range of CD decks, mixers and headphones and, actually, a couple of existing but somewhat underwhelming-looking active nearfield monitors. But the company also have a secret: TAD Labs, short for Technical Audio Devices Laboratories (http://www.technicalaudiodevices.com/#story). TAD Labs are a US-based offshoot company, a sort of Pioneer ‘skunkworks’ organisation, that design and manufacture a range of very high-performance hi-fi speakers, source components, amplifiers and PA drivers. And according to the marketing information, the RM-07 had significant TAD Labs design input. TAD Labs’ existence is not the only secret, however. Also not widely known is that, until very recently (and almost certainly during the RM-07’s development), the Director of Speaker Engineering at TAD Labs was a Welshman called Andrew Jones. Jones is steeped in British electroacoustic design traditions and values. Following a Physics degree from Surrey University, he joined KEF Electronics and learned his electroacoustics and speaker engineering skills under speaker-design doyen Laurie Fincham (for a touch of background on Fincham, there’s a good interview here). 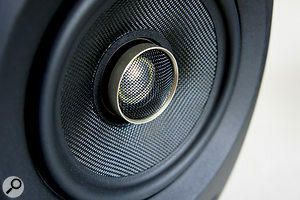 When the original KEF company foundered in the mid ’90s (they were bought, and are still owned, by Hong Kong-based Gold Peak Industries) both Fincham and Jones moved to the US and joined Infinity (www.infinityspeakers.com). Their paths only parted when Jones moved on to TAD Labs. But what, I’m sure you’re asking, has this got to do with the Pioneer RM-07? Well, during Jones’ time at KEF the company developed and launched their groundbreaking and patented ‘Uni-Q’ dual-concentric driver technology — and not coincidentally, I suspect, the Pioneer RM-07 features a similarly configured compound driver. The signal to the two concentric drivers is crossed over at an unusually low 1.6kHz.Describing the KEF Uni-Q technology as ‘dual-concentric’ is actually not entirely correct; ‘dual-coincident’ is more accurate. 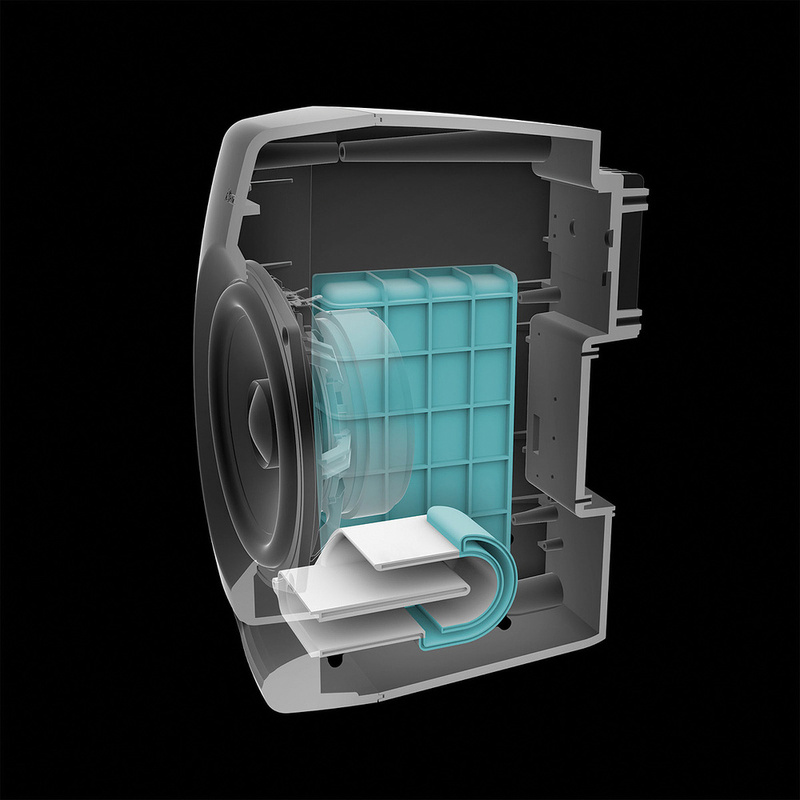 The difference may appear at first to be one of semantics, but it actually describes a significant variance between the KEF technology that looks, to my eyes, to have inspired the RM-07 driver, and the dual-concentric driver technology that went before it; the best known of course being from Tannoy. ‘Dual-concentric’ implies that two ‘elements’ are located on a common centre line, whereas ‘dual-coincident’ implies that the two elements are, effectively, in the same location in space. I’ve explained this, and why it is significant, in the ‘Short History Of Dual-concentric Drivers’ box. 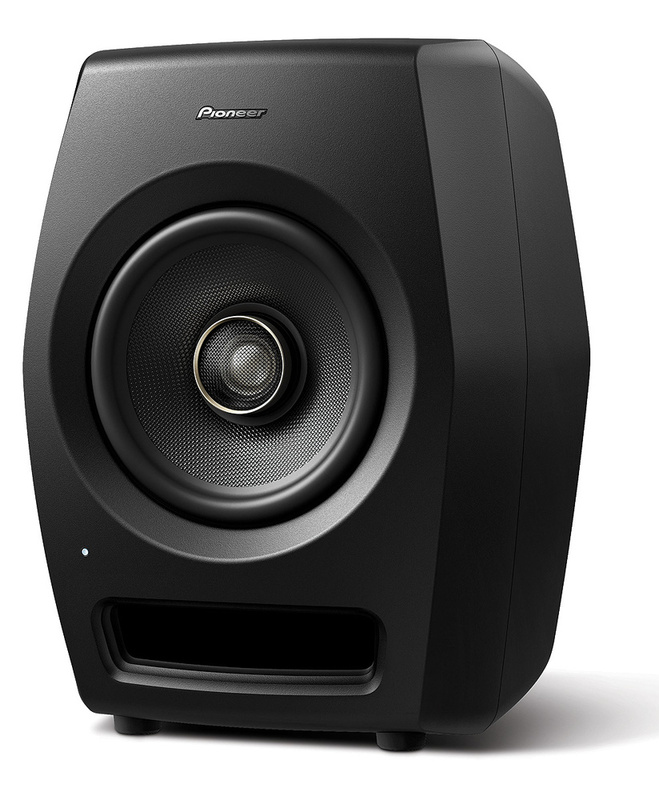 The single, compound driver of the RM-07 results in a speaker that looks a little different from the usual fare of inexpensive two-way active nearfield monitors. 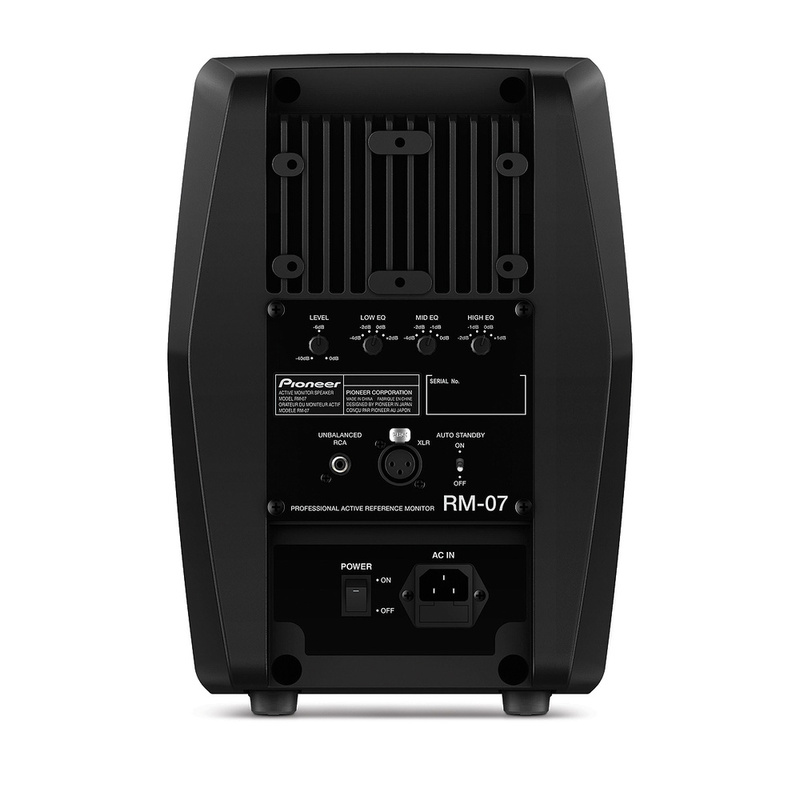 The RM-07’s enclosure is slightly dumpy of proportion, with a bulging of the sides and softening of the edges. The proportions don’t quite work aesthetically to my eyes and they’re not really helped by the unremittingly matte-black finish. I think something grey and classy might have worked better. And don’t get me started on that gauche, italicised Pioneer logo. I know it’s been that way for decades, but I’ve never warmed to it. Despite my aesthetic misgivings, the enclosure shape is an acoustically benign one, and its construction, fully in die-cast aluminium, gives it a rigidity and non-resonant nature that flat-panel, wood-based enclosures can only dream of. It is truly built like a brick cliché. The aluminium enclosure also endows the RM-07 with some significant weight. If there were a league table of kilograms per unit price for nearfield monitors, I’ve little doubt the RM-07 would be near the top. They felt an awful lot of speaker for the money when I lifted them on to my hyper-sturdy wall brackets. The rear panel offers low, mid and high EQ controls, as well as a non-detented input-gain control. The compound driver comprises a nominally 150mm-diameter woven Aramid fibre cone bass/mid element and a 30mm aluminium dome HF element. An upturned skirt on the HF dome is said to increase its rigidity so that the driver’s frequency response extends to 50kHz. The active crossover between the two drivers is at an unusually low 1.6kHz, which leaves me wondering a little whether the HF driver might not be somewhat prone to thermal compression as its voice coil warms up (because its voice coil will undoubtedly warm up more than it would if the crossover was more conventionally an octave higher). Amplification is provided by a rear-mounted module specified at 100 Watts for the bass/mid driver and 50 Watts for the HF driver. The amplification technology is traditional Class-A/B and its power supply is a conventional linear design with a toroidal mains transformer. Along with an IEC mains socket, rear-panel connectivity comprises just analogue balanced XLR and unbalanced phono input sockets. A gain control and some LF, MF and HF EQ options are also provided. I’ll describe the EQ options in more detail a little later, but I’ll have my usual moan about variable gain controls without detents now: you see, unless the gain is at maximum or minimum, it’s difficult to be sure that both speakers of a pair are gain-matched. The last remaining rear-panel feature is an auto-standby switch. When ‘on’, the RM-07 switches to standby mode after it’s been silent for a while, and switches back on automatically when it detects an input signal. I used the feature for a while but soon switched it off — I found it sometimes frustratingly slow to switch on. Back around the front of the RM-07, beneath the driver is a wide, letterbox-shaped reflex port that incorporates a few interesting and very unusual refinements. 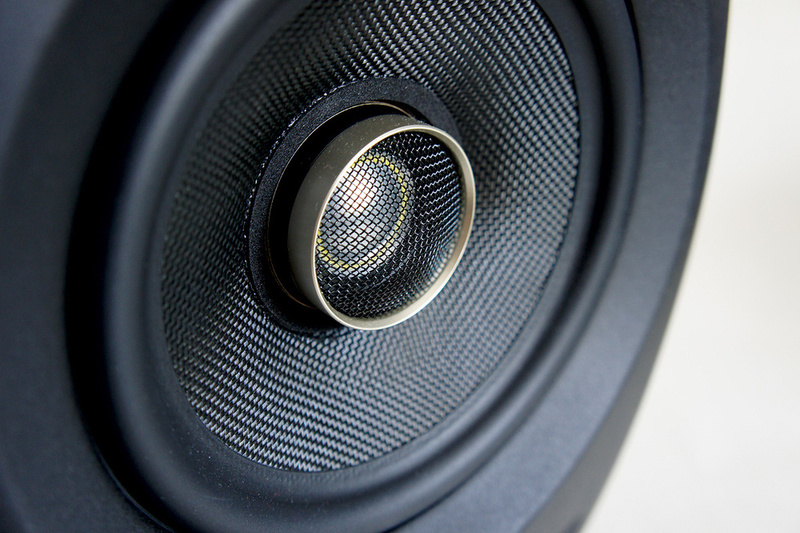 Regular readers will know that I am, by default, suspicious of reflex ports, preferring the simplicity and more accurate time-domain performance of closed-box speakers. If there has to be a reflex port, however, there are good and bad ways of implementing such things, and the RM-07 port falls firmly in the former category. Firstly, it appears to be tuned relatively low — around 45Hz. This means its real-world impact on time-domain performance is likely to be more benign that would be the case if it were tuned, as some are, significantly higher. Secondly, there are signs in the design of the port that effort has been expended on ensuring airflow remains linear, and in particular not coloured by a mid-range ‘organ-pipe’ resonance (see the ‘Pipe Down’ box). Inside the RM-07: a short, closed tube feeds off the reflex port at an anti-node location to supress the port’s ‘organ-pipe’ resonance. A particularly fascinating little feature that Pioneer call AFAST (Acoustic Filter Assisted System Tuning), revealed in the cutaway drawing of the RM-07 above, is designed to suppress the fundamental organ-pipe resonance. AFAST consists of a short, closed ‘pipe’ that feeds off the port tube. My guess is that the AFAST pipe is positioned along the port tube at an anti-node location of the potential organ-pipe resonance to provide a counter-resonance. Think of it as the acoustic equivalent of a mass damper. Fascinatingly, a technology piece I read a little while ago on the 2014 Ferrari F1 engine described its use of a very similar technique to modify the resonant behaviour of its exhaust pipes. I wonder who came up with the idea first or if their similarity isn’t coincidental? AFAST isn’t the only refinement of the RM-07 reflex port. At the port mouth there’s some complex flare profiling intended to manage airflow dynamics in order to delay the onset of noisy and non-linear turbulence, and within the port, it’s just possible to see a few adhesive damping pads stuck to the inside surface. These presumably are present to suppress mechanical resonance or, possibly, to further modify airflow dynamics. These various port refinements are genuinely unusual and point to the design of the RM-07 being by somebody who lives and breathes electroacoustics. Andrew Jones is, of course, prime suspect, and we enquired of Pioneer but they were unable, or maybe unwilling, to confirm Jones’ identity as designer — perhaps because he recently departed TAD Labs to join ELAC of America. Having a monitor perhaps designed by an engineer who lives and breathes electroacoustics doesn’t necessarily guarantee it’s going to sound any good — but we can relax on that front because, cutting directly to the chase, the RM-07 is good. In fact it’s really, really good — way better, indeed, than you’d expect at the price. To begin, with I was a little underwhelmed, but the more I listened, and especially as I listened to higher-quality material, rather than the Spotify stream that was playing when I first set up the RM-07s, the more I began to appreciate what I’d describe as its understated accuracy. With its EQ options flat, the RM-07 has a slightly warm, almost BBC-like tonal balance, so it doesn’t immediately seduce with overt clarity and detail. But as I tuned in to its qualities I began to appreciate that all the clarity and detail is present and correct, it’s just presented in a neutral and undemonstrative manner. 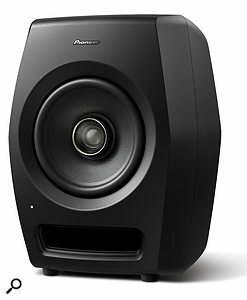 The RM-07 is not one of those nearfield monitors that will prove tiring with its insistent “listen to me!” character. Rather, it will just let you get on with your job, while it does its job of presenting reliable, consistent and informative audio. All the way from bass through mid to top, the RM-07 offers a coherence of character that sounds detailed and trustworthy. Along with its generally coherent and ‘together’ character, the RM-07 provides all the qualities you’d hope to hear from a well-sorted compound driver. Its dispersion, both vertically and horizontally, is wide and consistent, and its portrayal of stereo imagery both laterally and in terms of depth is focussed and stable. The RM-07’s slightly warm default balance is perfectly usable, but if your preference is to modify it a little, the rear-panel EQ options are well chosen to provide the right kind of subtle balance tweaks. The mid-range cut control, for example, is unusual but it works well. Not only is its operational frequency rather lower than usual (140Hz — right in that male voice band, just above bass, where rooms tend to misbehave), but as more mid is cut, the Q of the notch filter increases. The LF and HF options provide more conventional characteristics, but are again well chosen in terms of levels and frequencies: the shelf LF filter provides potentially useful compensation for boundary locations (especially when combined with the MF filter), and the HF shelf filter offers a little more or less ‘air’ at the very top end. And speaking of the top end, the HF driver displays the same slightly undemonstrative nature as the rest of the speaker, but it’s still usefully detailed and uncoloured. At the bass end of the bandwidth, while the RM-07 is unmistakably a ported monitor, I had no concerns that I was listening to an over-hyped or poorly sorted reflex alignment that trades LF bandwidth against value as a reliable mix tool. It seems to me also that a designer who has gone to so much effort to ensure the reflex port is linear is unlikely to be greedy of LF bandwidth only to end up paying the price in the time domain. I’ve been lucky enough to review in these pages a few extravagantly priced monitors with sky-high aspirations. 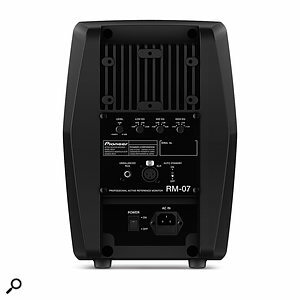 The Pioneer RM-07 is rather different, however, firstly in that it’s priced at around the entry level for serious active monitors, and secondly because it doesn’t really make claims to break revolutionary technological ground or overtly aspire to be the best. But of all the recent nearfield monitors I’ve tried it’s actually my favourite — not just because it works so well and fundamentally does the job, but because it seems to me to represent genuine, thoughtful, ‘old-school’ and skilful electroacoustic engineering of great integrity and quality. If I wanted to recommend it more highly, I wouldn’t know how. And no, I really never imagined I’d be writing that about a Pioneer speaker. It’s not front-page news that the world isn’t short of active nearfield monitors at or around the same price as the RM-07. Dynaudio, Adam, Genelec, PreSonus, Focal, Yamaha, Event, Eve and numerous other manufacturers can all offer competition for the Pioneer RM-07. Take your pick. Perhaps the first question to answer in any discussion of dual-concentric and dual-coincident ‘compound’ drivers is: what’s the big deal? Well, the big deal is that in any speaker system in which the audio band is covered by multiple drivers, the problem of ‘crossing over’ from one driver to the next is exacerbated if they’re not in the same position in space. The path length, and therefore acoustic ‘flight time’, from each driver to the ears changes as the listener moves, and due to the resulting phase changes, the system frequency response also wanders about. This unavoidably applies to all speakers with displaced multiple drivers, even ones advertised as ‘time aligned’ or ‘linear phase’. They will only fit that description at a discrete set of positions in space (the corollary of which is that speakers not advertised as time aligned or linear phase are actually likely to be just that at a different set of discrete positions in space). Conventional displaced multiple-driver systems also tend to to be characterised by an awkward dispersion discontinuity, where the narrowing radiation of the bass/mid driver hands over to the initially much wider radiation of the HF driver. So, arranging for multiple drivers to be dual-concentric or, even better, dual-coincident, potentially wipes away two of the fundamental technical issues of multi-driver systems. Diagram 1: A simplified Tannoy-style dual-concentric compound driver. The classic Tannoy dual-concentric driver (actually five years pre-dated by Altec Lansing) is arranged as a conventional bass/mid driver with a high-frequency driver mounted on the back of the magnet and radiating through a hole in the pole-piece. Diagram 1 illustrates a simplified version of this topology. 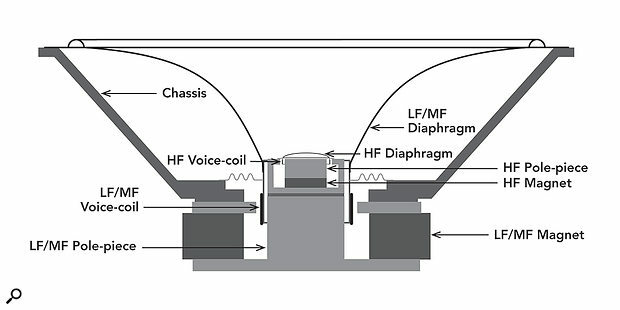 While the Tannoy solution achieves the basic aim of drivers on the same centre, albeit with the HF driver significantly behind the bass/mid driver, it has a fundamental weakness in that an HF driver radiating through the pole piece can only really be horn loaded — in effect, it’s a PA-style compression driver. Horn loading of course brings increased radiation efficiency, but it also results in narrow dispersion and often higher levels of coloration (particularly if the horn shape is compromised by also playing the role of pole-piece and bass/mid diaphragm). Laurie Fincham’s KEF dual-coincident solution was driven by the development of rare-earth permanent magnets in the ’70s. Fincham realised (before anybody else, hence the patent) that, with a neodymium-iron-boron magnet, a high-frequency driver could be made both small enough and sensitive enough to sit on the end of a bass/mid driver pole-piece, where it would be both on the centre-line and at, or at least very close to, the acoustic centre of the driver. Diagram 2 illustrates this topology. Diagram 2: A simplified Pioneer/KEF-style dual-coincident compound driver. I wrote that these compound driver topologies “wipe away two of the fundamental technical issues of multi-driver systems”, and they do. But of course, as is the way with speakers, they introduce some issues of their own. 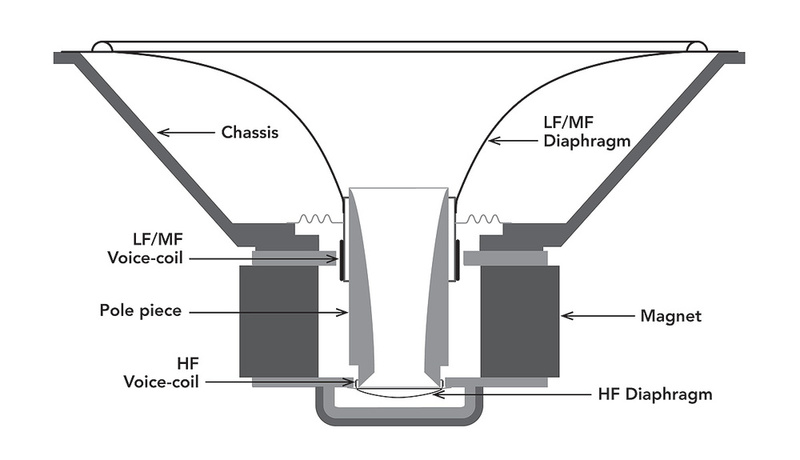 The first is that, even with the KEF arrangement, the dispersion characteristics of the HF driver are unavoidably influenced by the bass/mid diaphragm. 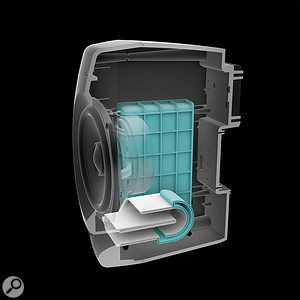 Unless the the bass/mid diaphragm is made flat there is a degree of ‘horn’ loading inevitable from its conical surface (Technics do actually manufacture a flat-diaphragm dual-coincident hi-fi speaker). This means there’s a compromise to be managed between the diaphragm shape required to achieve the desired bass/mid driver characteristics, and that needed to optimise the performance of the high-frequency driver. The KEF approach has been to develop the dual-coincident high-frequency dome and bass/mid driver so that they work together to create a seamless compound driver with close to ideal dispersion characteristics; and while their original basic patent has now lapsed, some more recent patents protect significant aspects of this technology. A second potential issue that can arise with compound drivers, at least in theory, is high-frequency intermodulation distortion caused by movement of the surrounding and adjacent bass/mid diaphragm modulating the output of the high-frequency driver. Imagine for a moment that the bass/mid cone is moving backwards and forwards at, say 80Hz, and the high-frequency driver is simultaneously playing a 3kHz tone. Modulation of the 3kHz signal by the 80Hz signal will potentially result in signals at 3.080kHz and 2.920kHz (the sum and difference of the two frequencies). The level of the intermodulation distortion increases with movement of the bass/mid diaphragm, but its audibility is not cut and dried. Some claim it’s a deal-breaker, although those that do tend not to have the technology or the means to develop it. Personally, I reckon such distortion is potentially audible when a compound driver is used in a small two-way system. My own pair of KEF LS50s, for example, can, I think, sound slightly cleaner at the top end when their reflex ports are left open so that low-frequency bass/mid diaphragm movement is reduced. 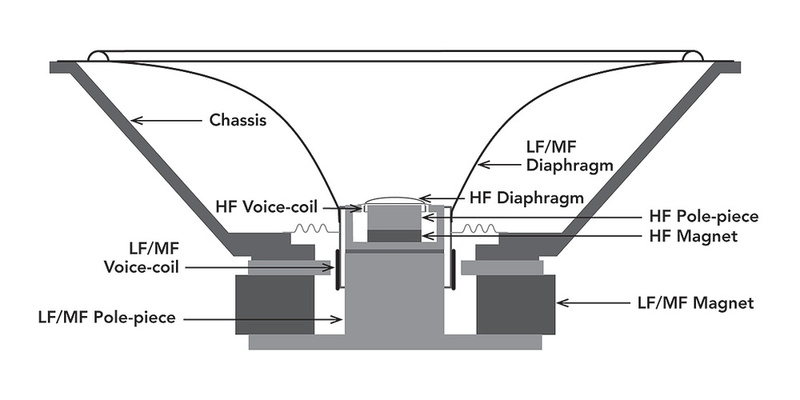 One technique, and the one used on the RM-07, for potentially reducing both intermodulation distortion and generally the influence of the bass/mid diaphragm on a concentrically mounted HF driver, is to constrain the dispersion of the HF driver a little with its own waveguide. While there are potential down sides to this technique — the dual-coincident nature may be degraded, and dispersion discontinuities between the two drivers are likely to become more pronounced — it perhaps has a further advantage for Pioneer in that it partly negates the risk of infringing any of the more recent KEF patents covering the close integration of coincident drivers. When we talk of reflex port resonance we think primarily of the of the ‘slug’ of air in the port bouncing against the spring provided by the air in the enclosure. This is a Helmholtz resonance (after the German physicist and philosopher) and is the one that a ported speaker employs to extend low-frequency bandwidth. But many ports demonstrate a second, much less desirable resonance higher up in frequency that’s analogous to that of an organ pipe (or any other wind instrument really). Typically, and depending on the length and diameter of the port tube, the organ-pipe resonance can be anywhere between, say, 300Hz and 1.5kHz. It will usually be a relative high-Q resonance and can reach a level as loud as the desired output of the port. Needless to say, port tube organ-pipe resonance is not a good thing! Graph 1: The port output of the Pioneer RM-07. To illustrate this phenomenon, I generated a couple of frequency response curves using FuzzMeasure Pro. The curves were generated by placing a measurement microphone right at the mouth of the port and, and as such, will be contaminated to some extent by the output from the adjacent bass/mid driver; however, in my experience such measurements can provide reliable comparative data. Graph 1 shows the port output of the RM-07, from 20Hz to 2kHz. The Helmholtz resonance is obviously revealed at around 45Hz, above which the output decays into ‘noise’ with only a couple of mild potentially resonant features apparent. Graph 2: The port output of an unnamed monitor. Graph 2 shows a similar measurement for an unnamed monitor with a similarly tuned and similarly proportioned port. This port has no features obviously designed to suppress organ-pipe resonance, and displays significant resonant features at around 480Hz, 700Hz and a little over 1kHz. About The Author: Phil Ward’s loudspeaker career began in 1982 when he joined UK hi-fi company Mordaunt-Short in a junior design role. After leaving Mordaunt-Short in 1987 for a spell in audio PR, Phil joined Canon as Design Manager for the Japanese multinational’s range of consumer and custom install speakers, and then Naim Audio as speaker design and project manager. Since 2001 Phil has worked as a freelance consultant and writer across both the pro and consumer audio sectors. Phil plays electric and double bass and has recorded, produced and mixed numerous bands and artists. Phil's blog can be found at http://musicandmiscellany. Consistent dispersion and imaging from a quality compound driver. All the qualities needed for a trustworthy mix tool. Proper attention to electro-acoustic detail delivers the goods. The RM-07 is a classy and well-engineered monitor that delivers genuine quality and engineering integrity at an entry-level price. £1138 per pair including VAT.